Sugar is everywhere. We know that bread is full of carbs that we don't need, but did you know that most of your favorite foods are loaded with extra sugar? Sugar is everywhere. I've been making small changes in my lifestyle and seeing some results in looser fitting clothes and almost a 20 pound weight loss, but I know that I need to give up added sugars if I want to see more results. I weighed and measured myself today, and I'm going to cut out sugar for the next 30 days to see what my results are. Even though I'm terrified of the effects of sugar on my body, I am also scared to give up sugar. I like sugar. Who doesn't? I think what scared me was the thought of never having sugar again. So instead of banishing sugar forever, I'm going to do it for 30 days. Maybe I'll reward myself with something sweet after the month is over, but if the past is any indication of the future, I don't think I will miss the sugar. I've given up sugar before with great results. I think I went about two years on a low carb diet with limited sugar. I had some life changes that made it difficult to stay with that lifestyle, so I fell off the bandwagon. To be honest, I was shocked at how sweet everything tasted when I started to eat like I had previously. I'm joining SPLENDA® Naturals Stevia Sweetener to take the #GoodbyeSugar30 Challenge. I'm going to track my results, and I'd love it if you would join me. 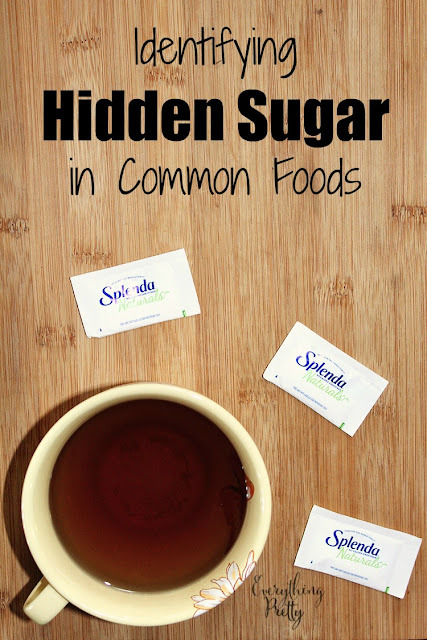 During the challenge, you'll identify hidden sugar and replace it with SPLENDA® Naturals Stevia Sweetener for fewer calories and sugar without sacrificing taste. Before I eat anything for the #GoodbyeSugar30 challenge, I will be checking the label. The closer these ingredients are to the beginning of the list, the more there is in the product. Have you read labels lately? There's probably sugar lurking in your favorite salad dressings, condiments, pasta sauce, granola bars, and even in yogurt. I'll be cutting out most of the sugar that I used to consume and replacing the rest with SPLENDA® Naturals Stevia Sweetener. I can't start my day without coffee, and I finish the day drinking white tea. I need a little sweetness to enjoy it, so I'll be using SPLENDA® Naturals Stevia Sweetener. SPLENDA® Naturals Stevia Sweetener has a sweet taste with no bitter aftertaste or added flavors. It gets its sweetness from Rebaudioside D (Reb D.), a stevia leaf extract that tastes sweeter than Reb A., which is traditionally used for sweeteners. The Reb D. and Reb A. complement each other for a perfectly sweet taste. Stevia leaf extract comes from the stevia plant leaves. The leaves are harvested, dried, and then steeped in water. The liquid is then processed to extract the sweetening compounds, namely Reb D.
Be sure to sign up for my newsletter to get an email in 30 days when I update you with my results!